University around 1931-32. I am not sure. 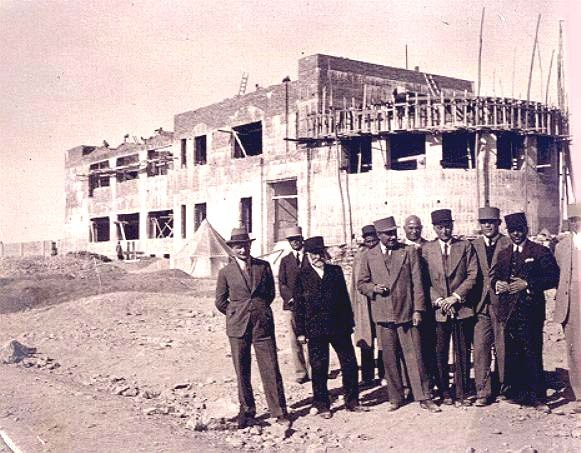 These are the people who by the order of Reza Shah Pahlavi & their own dedication & hard work brought us the blessing of a UNIVERSITY. May all rest in peace. The first person on the left is the German architect. The gentleman on the middle with cigarette in his hand is the then Minster of Education, Ali Asghar Hekmat. The third one from right is my father Abdol Hamid Hakimi, project manager. I am sorry that I do not the rest.